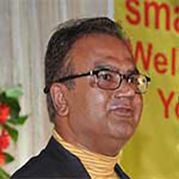 Dr. Sanjai Tiwari started smartData Enterprises Inc. in 1996 and was instrumental in securing the early financing and first customer in Silicon Valley. He is an active Chairman guiding the management, finance, legal, corporate structure, and expansion strategy. He has worked and lived overseas in the US and Japan for more than 30 years and speaks 3 languages. He earned Bachelor of Technology degree from IIT Kanpur, Masters and Ph.D. from Stanford University. Chairman conducts Mixer and Mountain Climbing Invitation events during his frequent visits to India and loves watching cricket and playing golf.